44 year old presented to the ER with severe proptosis and loss of vision following a bout of coughing. Vision was LP and IOP 60 mm Hg as measured by tonopen. History was significant for blood thinners that was strated 2 years prior following bypass and cardic stent. Whta is the diagnosis and outline the managment? * Orbital hematoma is an emergency and can lead to blindness from Optic nerve or retinal circulation compression. 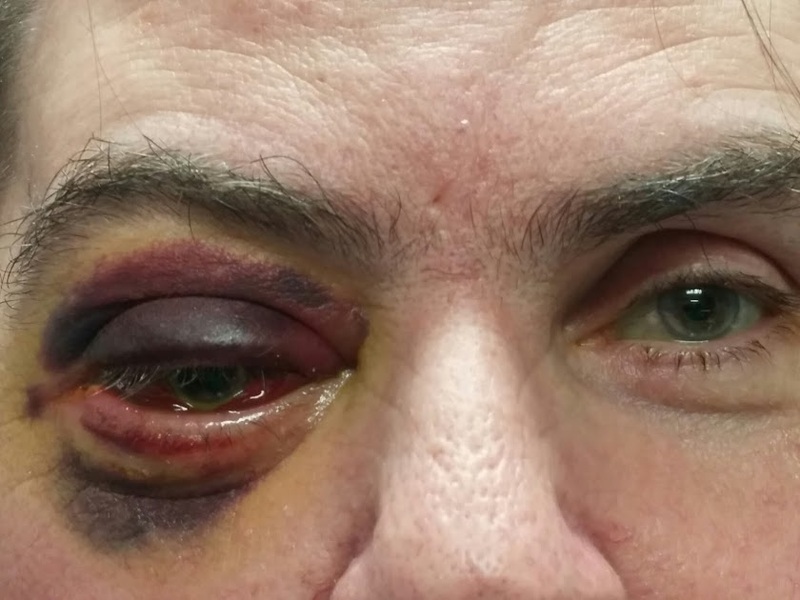 Acute orbital compartment syndrome with visual acuity loss is an emergency. Permanent blindness occurs if effective therapy is not initiated in a timely manner. Emergent decompressive surgery (ie, lateral canthotomy and inferior cantholysis) may save sight in patients with severe symptoms. Remember, irreversible visual loss can occur with retinal ischemia that lasts longer than 120 minutes. Management: This is a true emergency. There may not be time for imaging studies. Emergent decompression surgery should be the treatment of choice. The emergency procedure of choice for acute loss of visual acuity associated with acute orbital compartment syndrome is dissection of the lateral canthus and disinsertion of at least the inferior crus of the lateral canthal tendon (ie, inferior cantholysis), which allows complete mobility of the lower lid. Visual loss without definite signs consistent with increased IOP is not an indication for this procedure. What happened to our patient: Underwent emeregent lateral cantholysis in the ER by the Glaucoma fellow resulting decompression and decrease in IOP. VA improved from LP to 20/50 with in a few hours. At one week, the vision was 20/40, IOP was 15 but still had significant OM restrictions along with propotosis. He is expected to make recovery with in the next few weeks. Excellent post! Keep 'em coming!